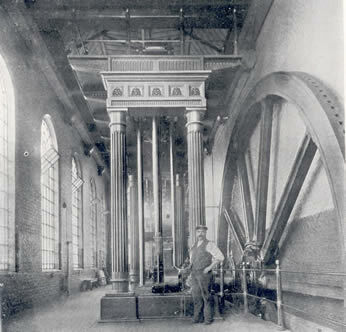 Housed in its original Grade II listed Engine House in the former sewage treatment works for Tottenham, it now forms part of Markfield Park. Contractors have started a programme of tree works in Markfield Park this week. The works include crown lifting trees to increase clearance for pedestrians and mowers. A small number of trees will be crown reduced because they have been managed like this previously or they have minor defects. One Poplar tree is to be felled because it is a hazardous condition and a small number of trees will have significant crown reductions to create 'monoliths' because they have been colonised by decay fungi. Monoliths is a term used where a mature tree is reduced to leave a section of trunk, usually 5-8 tall, which is retained for a wildlife habitat for insects and nesting birds. The works should take two weeks to complete. Haringey Council secured funding for some new trees for the park. They've now been planted by Haringey Parks Department including the Borough's Tree Specialist with the help of local volunteers. Thanks to Haringey Council Parks Department and everyone who turned up to help! Last November we planted 1000 daffodil bulbs for a good display in the Spring! With some of Markfield's trees down in last year's storms, it was all the more important to get bulbs planted. Get involved & out in the fresh air making a difference to ourselves & to our neighbourhood! - See the Conservation page for more outdoor fun!